Thule van bike racks are perfect for taking your bikes on your travels – safely, easily and securely. So start planning your next bike trip. Specifically designed to handle the tremendous forces on the back of an RV/travel trailer, this carrier is durable, protective and secure. 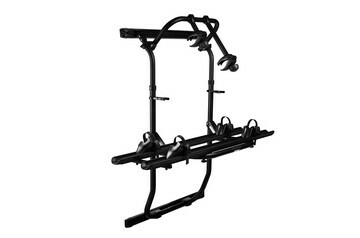 Quick and easy to install bike rack for your van. Van bike racks can be mounted on the rear door, allowing full use of the door. 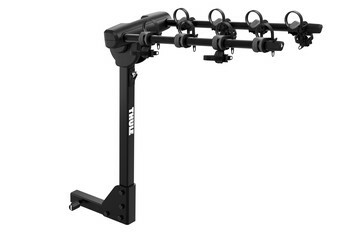 But, if you want to bring heavier bikes such as e-bikes, we recommend a Thule towbar bike rack. Whatever you choose, you’ll get a secure, sturdy and stylish rack, packed with smart features such as lock systems, wheel holders and fast-click connections. Made from extra strong aluminium to guarantee stability and reliability, Thule bike racks have been leading the way for years. They are TÜV-approved and no wonder as they’ve been tested to the limit and beyond at the Thule Test Center. There, our bike racks must pass stringent crash tests and tough usage simulations, not to mention survive extremes in heat, cold, rain, sun and even harsh chemicals.